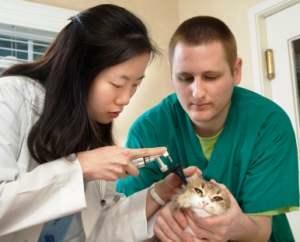 If your cat suffers from polyps, recurring infections, or some types of tumors, ear surgery may help. Knowing why the surgery is required and how it may benefit your cat long term can help you make the best choices for your kitty's health. The presence of polyps in your cat's ear canal can become a threat to the integrity of the cat's eardrum, as well as to the structure of the ear canal. Symptoms of polyps are similar to those of a bacterial or fungal infection of the ear. The cat may shake or scratch at her head, rub her face or ear on the floor or on the edges of furniture and tilt her head. The cat may not be able to walk a straight line. A thick or bloody discharge may be present. A vet will examine your cat to differentiate a diagnosis of polyps from an infection or even a cancerous condition. If polyps are causing sufficient blockage, the vet will attempt to remove them surgically. If treated early, bacterial infections and fungal infections can usually be eliminated without surgery. Infections from foreign bodies, such as foxtails, can cause inflammation and infection. Ear mites can also cause inflammation and infection. The usual treatment for an infection of any type is to clean the ear thoroughly, remove any foreign material and apply topical and oral antibiotics or anti-fungal drugs as indicated. If an infection is not treated in a timely manner, the ear may become so inflamed and blocked with material that it is impossible for your veterinarian to clean the ear properly and apply the appropriate medications to the ear canal. If cat ear surgery is indicated for a blocked canal, be sure your vet has had experience with this type of surgery. Resection of the ear canal is a fairly complex surgery that requires both experience and expertise in feline ear surgery. Once you have consented to surgery, the vet will anesthetize your cat. Next, the ear canal is cleaned out and flushed with a detergent solution and antibiotics. The vet will then, in effect, rebuild the ear canal. Once the cat is sufficiently well for home nursing care, the vet will send her home with antibiotics and pain killing medication. Fortunately, there are now several effective pain killing medications for cats. Cats can develop both benign and malignant cancers of several types in their ears. Benign tumors are surgically removed if they block the ear canal or interfere with a cat's comfort and mobility. If possible, malignant tumors are surgically removed. Chemotherapy and radiation often follow tumor surgery. Follow up is necessary to assure that the tumors do not return. Squamous cell carcinoma is a cancer that causes erosive lesions. White cats are particularly prone to them. In non-white cats, these cancers usually occur on areas with little pigmentation. Diagnosis of squamous cell cancer requires aggressive treatment. Surgical treatment of squamous cell cancer of the ear often requires that the entire ear be amputated. In other cases, only the affected area of ear is surgically removed. Surgical treatment is followed by chemotherapy and radiation, if necessary. The cat's owner is also advised to keep the cat out of the sun to avoid the development of additional cancerous lesions. If your cat's ear infections are treated early and aggressively, she can probably avoid cat ear surgery. Polyps and cancerous conditions usually require surgery. If you're in doubt about your veterinarian's experience with ear surgery, you may wish to ask for a referral to a specialist.